Most of us don’t know how many Mobile SIMs are registered on our name. There are chances that someone have succeeded to obtain a SIM registered with your name without your knowledge and such unknown SIMs can also be used by criminals and terrorists. Keeping your security as priority, Pakistan Telecommunication Authority (PTA) has developed a SIM Information System to address associated risks on security and to ensure subscription regulations in cellular sector. Now You can Track how many SIMs are registered with your name via internet or by just sending a free SMS. And you will get a quick sms reply from the service which will contain number of registered SIMs of each mobile network on your CNIC. The objective of the project is to provide a consumer-based facility to mobile subscribers in Pakistan by which they would be able to find out the total number of SIMs registered against their respective CNIC number with each mobile operator, and can block extra unknown SIMs in time to protect themselves from any liability. With this system, you can not only check SIMs on your name but on the name of your friends and other family members. 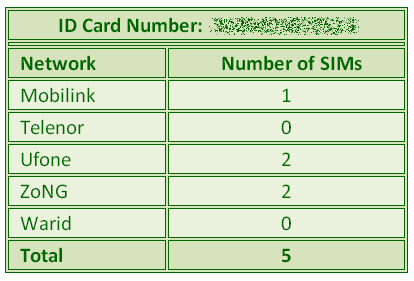 How to Check SIMs Registered on any CNIC? Just follow the link give below, and enter your CNIC number without dashes. You can also send ur 13 digits Computerized National Identity Card Number without dashes ( – ) to 668 and know how many sims are registered to ur name. This is a free service and there are no charges associated with it. Update: Foreign nationals who have registered Pakistani SIMs can also verify the record on the above mentioned URL and by entering Foreign ID. How to Block any SIM registered on your Name? It is advised to you to block all unknown SIMs that are never purchased by you so that no one can use your SIMs for any illegal activity. Visit Customer Care Centre of the relevant company whose sim you want to block. They will give you a form to complete and sign. Once this done, those sims will be blocked and deleted within 24 hours from your record, however, PTA database can take up to 45 days to update. You can download complaint form from respective mobile company's website. A first Application to check the Number of SIMs registered on the Name of a Person. Just provide the CNIC Number of a person and the app will check and let you know how many SIMs are registred against that Person's CNIC Number. 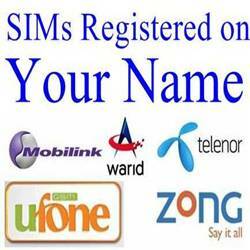 This will show you number of SIMs registered in all Mobile Telecom Companies of Pakistan. I verified the link and it is working perfectly. Plz check it again.